Late last month, an excavator operator was working at a peat bog in the Polish municipality of Mircze when he accidentally stumbled upon this glorious specimen of 14th century craftsmanship. The remarkably well-preserved longsword is a unique find for the area, and its discovery has prompted an archaeological expedition. The discoverer of the long sword, Wojciech Kot, donated the artefact to the Fr. Stanisław Staszic Museum in Hrubieszów, and the museum’s staff is currently analysing the medieval weapon. The sword is badly corroded, but considering it’s been buried in a peat bog for over 600 years, it’s condition is rather remarkable. Only the original hilt, which was likely made from bone, wood, or antler, is completely gone. The rear bar of the sword features an isosceles cross inscribed inside the shape of a heraldic shield, which was probably made by the blacksmith. As Fr. Stanisław Staszic Museum director Bartłomiej Bartecki explained to Poland’s public science site PAP, this symbol was likely the maker’s brand, and would normally be obscured by the sword’s hilt. The area is first appears on the historical record in the 13th century where it’s mentioned as the site of a few hunting lodges surrounded by forest. The region was part of Ruthenia (aka the Kievan Rus) then and was absorbed by the Kingdom of Poland in 1366 century after the disintegration of the Rus. The Polish governor built a castle in Hrubieszów in the late 14th century. So at least the second half of the century offered good employment opportunity for knights. Or he could have just been riding through and made a wrong turn into the bog. 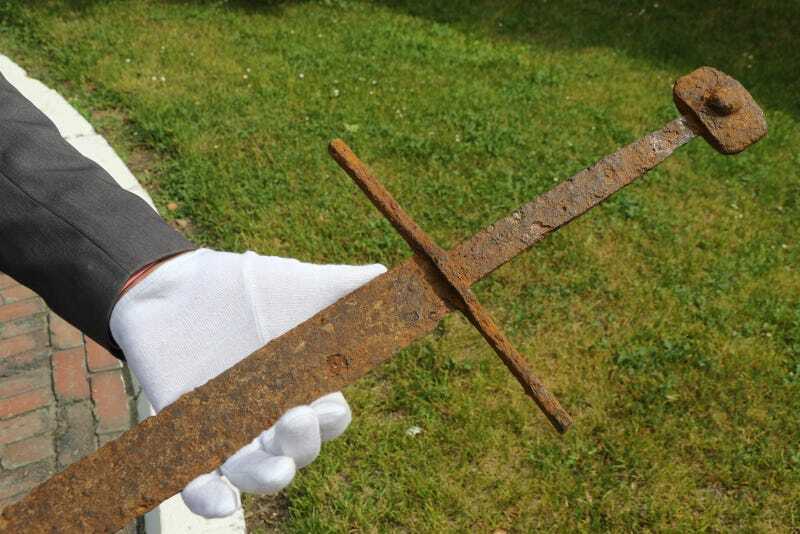 In the coming days and weeks, archaeologists will carry out limited excavations at the peat bog where the sword was found; the researchers are hoping to find the missing elements of the knight’s equipment, and other clues that could explain how the weapon ended up where it did. As for the sword itself, it’s still undergoing analysis, and it will eventually be preserved and put on display at the museum. Federal police in Argentina recently discovered a time capsule of evil, hidden inside a house near Buenos Aires. Rome wasn't built in a day... and neither was Alexandr Trubetskoy's recreation of the ancient empire's road network in transit map form. Because the fossils were uncovered in Morocc, the discovery is also resetting our notions of where and how modern humans evolved. "Come hither, Atticus, and gaze upon the humorous feline indentation. Share, if you will, the news far and wide, and subscribe to my weekly scroll."